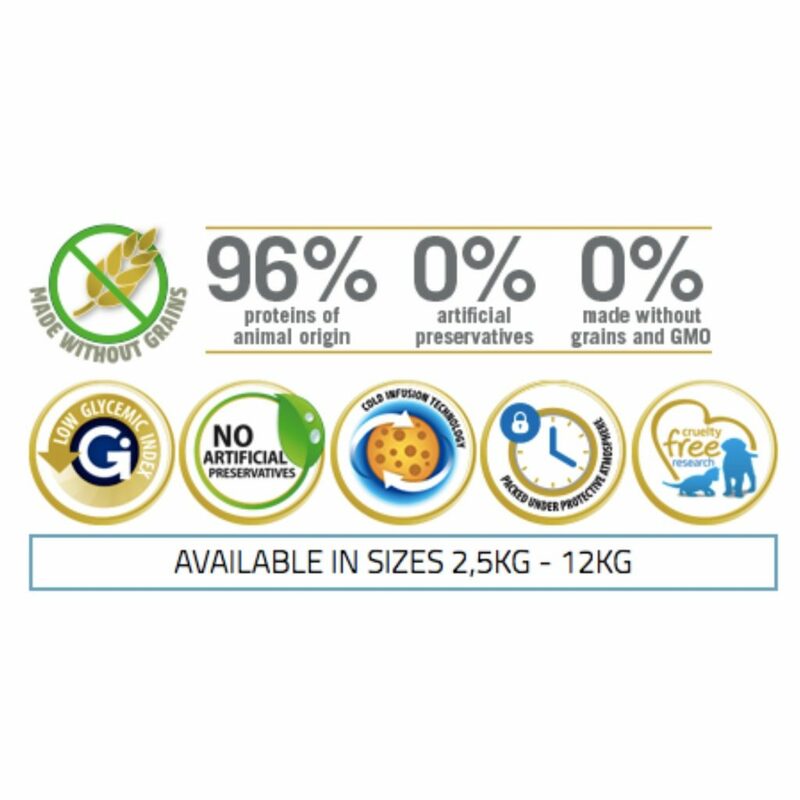 --APT FOR ADULT DOGS (Medium & Maxi Breed)- Farmina N&D Grain Free Pumpkin, Chicken & Pomegranate Adult Dog Food is apt for adult dogs of medium and maxi breed. 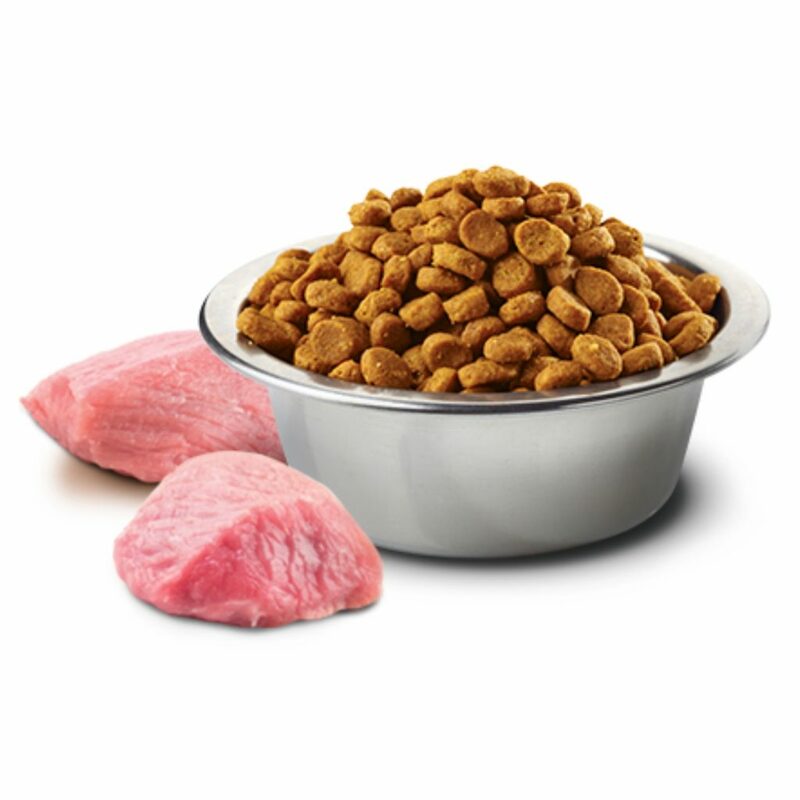 --RICH IN PROTEIN- The diet contains 60 percent of high-quality animal ingredients that makes it rich in animal protein which is very close to a dog’s natural diet. --IMPROVES SKIN & COAT- The product contains ideal levels of EPA-DHA that helps in improving Skin and Coat. 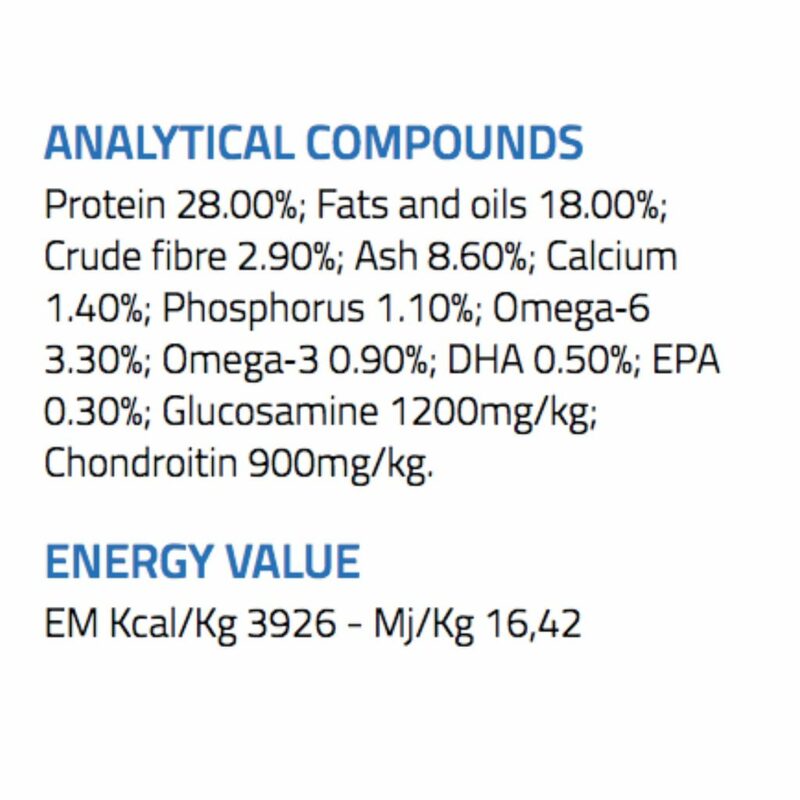 --MAINTAINS HIGH ENERGY LEVEL- This Dog Food is an assortment of all essential ingredients that help in maintaining the high energy level of dogs of medium and maxi breed. --SUPPORTS OPTIMUM GROWTH- This diet is designed to meet the specific needs of medium and maxi breed dogs to promote growth throughout every stage of their life. --ENHANCES BONE STRENGTH- This Dog Food is high in glucosamine & chondroitin that helps in enhancing the bone strength of adult or ageing dogs. --PROMOTES HEALTHY DIGESTION- This diet contains pomegranate extracts that help in improving digestion and reduces inflammation and skin irritation. --GRAIN FREE FORMULA- This diet is prepared with a grain-free formula that supports healthy life of these dogs. 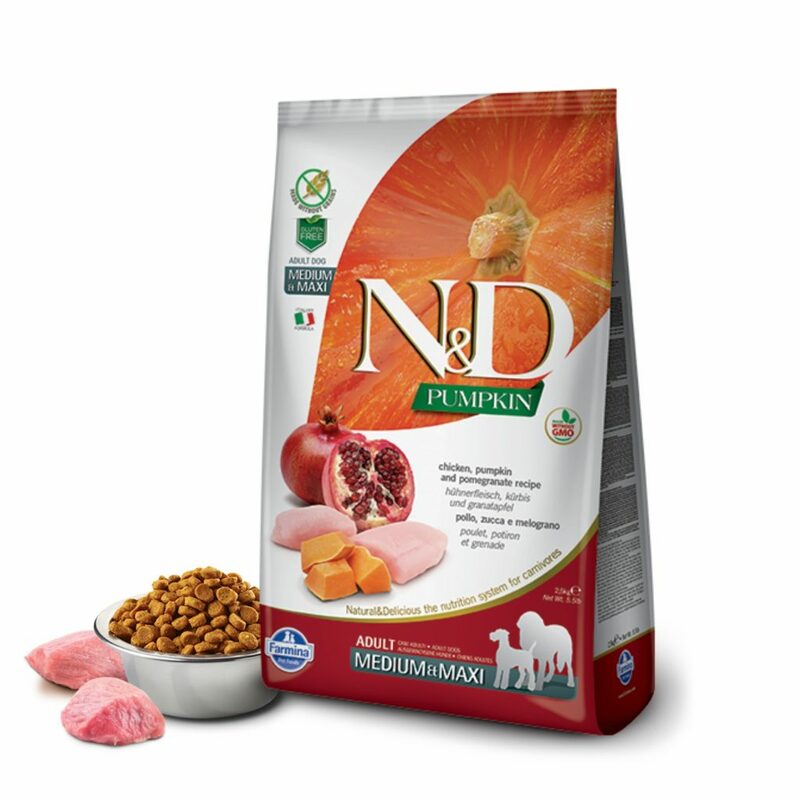 Farmina N&D Grain Free Pumpkin, Chicken & Pomegranate Adult Dog Food for Medium & Maxi Breeds is a diet apt for adult medium and maxi breed dogs. This food is a grain-free formula that contains ideal levels of EPA-DHA that helps in improving the skin and coat of these dogs. This diet is designed to meet the specific needs of the dogs of these breeds to promote growth throughout every stage of their life. This diet is rich in glucosamine & chondroitin that also helps in enhancing the bone strength of adult or ageing dogs. 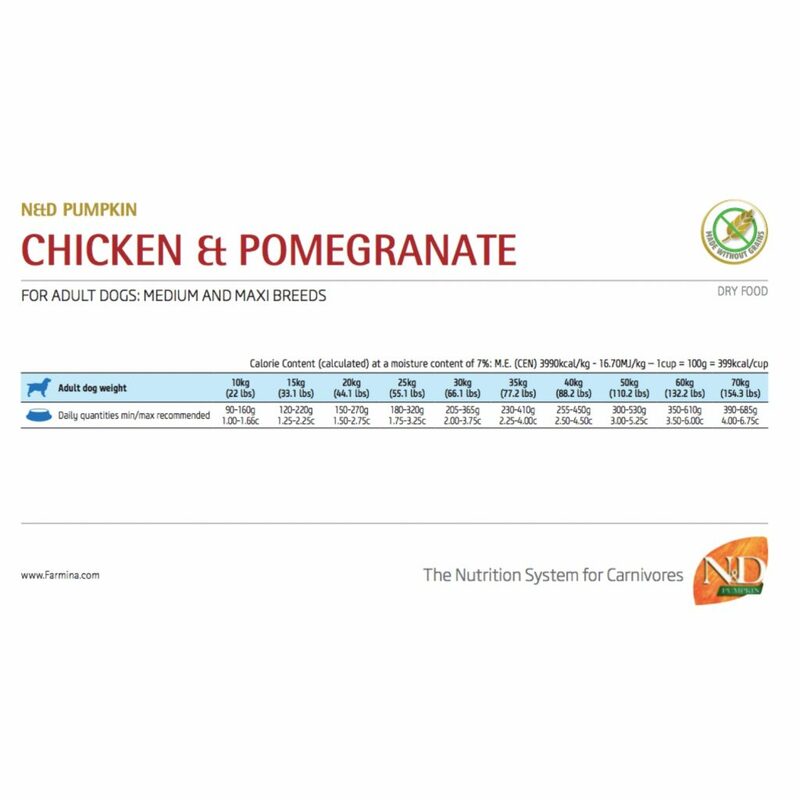 Farmina N&D Grain Free Chicken & Pomegranate Adult Medium & Maxi Breed Dog Food is an assortment of all essential ingredients that help in maintaining the high energy level of dogs. Also, the diet contains pomegranate extracts that help in improving digestion and also reduces inflammation and eradicates skin related issues.